Hello everyone. It has been a while since I posted my last project. I started a Youtube Channel Cis4Crafting earlier this year and has been posting videos every week over there. If you like what you see here you probably will enjoy my videos over there. Feel free to stop by. Today I'm showing you how you can hem a dress pants/dress/skirt without using a sewing machine. I do have a sewing machine-not a fancy kind but I love it. I love hand sew stuff. I don't know how to explain that. Yes, if my project involves a huge piece of fabric I'll definitely use the sewing machine. However, I like just holding the needle and pull the threads when doing small projects like doll clothes, kids clothes, embroidering and in this case hemming pants. I just learned this hand stitching recently. It is called blind slipstitch. I have found a photo from Pinterest that explains it really really well. It is Four hand stitches you need to know by Byhand London. 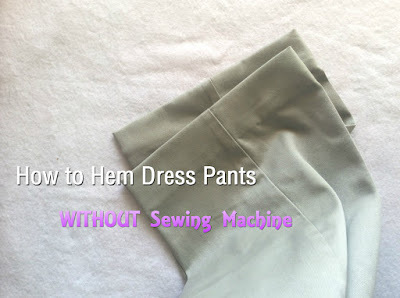 Read that first if you want to try this hemming technique. I think that post explained it better than I did in my video. But you'll welcome to read thru my post and watch my video. thread, similar color to your pants, if you have limited options of thread, use white for light color clothes and black for dark. I summarized this blind stitch as "catch->tunnel". You'll see what I meant in the video. Hope you have the chance to practice in your pants. Job hunting + interview season!!! Good luck to those who are looking for new jobs. See you next time!